(Text automatically translated) High-class penthouse renovated in 2011 with stunning views over the bay of Santa Eulalia enjoyable from its large terrace. Tastefully decorated and fully equipped to make your stay perfect. My friends and I had a wonderful stay at Ana and Michelangelo's apartment. The location is great, right by the beach and the town of Santa Eulalia where there are many great restaurants. There is also a ferry which goes straight to Formentera island which we visited. It is also a short taxi from some of the other great beaches on the island and about 25 mins from Ibiza town. It also has good facilities in the apartment to cook as well, which we did for breakfast and some lunches. The apartment was very clean and we had no problems. Air con was also very good. Our favourite part was the terrace which has a wonderful view of the bay. Thank you Ana and Michelangelo for hosting us, we would recommend your apartment to anyone looking for a relaxing stay in Ibiza and it is a great base for exploring the island. This is the second time we have been to this resort and stayed in this fabulous apartment. The outside space is amazing and the views spectacular! This was our second visit to the apartment. Wonderful relaxing holiday in beautiful apartment in a beautiful resort. The views from the apartment are amazing. The apartment is so near to the sea you wake to the sound of waves rippling. The beach is just a few minutes walk away from the apartment. The apartment is clean and well equipped and provides such a relaxing environment. The owners Ana and Michelangelo are very friendly and helpful. We'll be visiting next year. 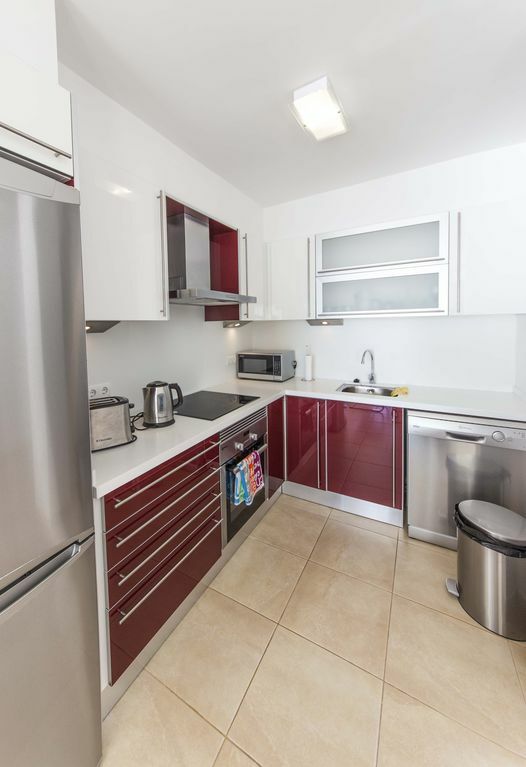 This apartment is in a perfect location and has all the space and facilities you will need to have a fun and relaxing holiday , it is also very clean and in a lovely building . Ana could not have done any more for us , they both went above and beyond what we expected and we were extremely grateful for everything they done . Hope to be back one day . "The appartment is great...very nice decorated, clean and has everything you need and more. The location is fabulous and the owners of the appartment are very helpfull! If I go back to Ibiza I will be staying here again!" "For 30 years we visit Spain from hotels till private houses and appartments. In the range of private houses and appartments we never had such a nice place as the Penthouse from A&M. Verry, verry clean and super new-modern place! Just full renovated, and top renovated! Interieur: from white leather sofa''s, every room a flatscreen and a perfect airco, 2 modern bathrooms, jacuzzi in 1 bedroom, brand new dishwasher till new washing machine and dryer..it was all more than perfect! Outside you have a corner terras (I think appr. 170 m2) with lounge set and dinner table for 6. Verry nice that we could eat and drink royal outside. The vieuw from terras and also from the living room is spectacular, all vieuws at the sea. Santa Eulalia we''ve visit for 4 years and it is a verry nice place with nice restaurants, shops, bars at a romantic boulevard etc. Not a hotspot for party people! Than you must go to San Antonio or Playa ''d Bossa. A&M are verry nice people, was a good feeling that (when it was needed)we had them arround! fianza pedida, entrega de llaves realizada por propietario.